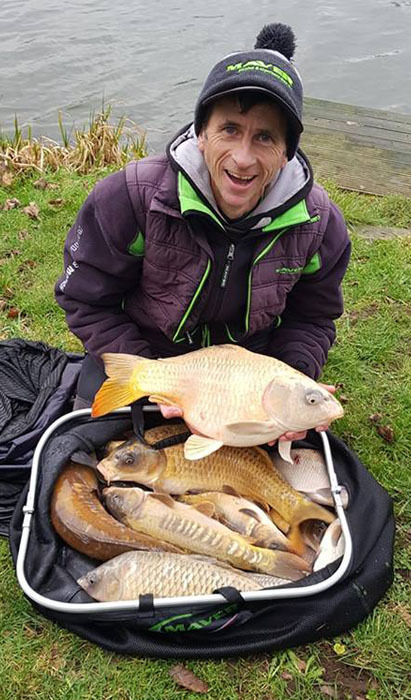 Andy Kinder has recently confirmed a first place finish on the Maver Pairs league at Maver Dynamite Hayfield Lakes. A grueling ten-round series, which began back in November of last year, saw a high caliber of angler go head to head at the Northern bagging mecca in a bid to be crowned 2018-2019 Champions. Final placings were determined via an overall points score with anglers having the opportunity to drop their three (3) worse results from the ten (10) rounds fished. Anglers were pegged across a total of four sections with two sections on Adam’s lake and two sections on Island lake. The pair with the lowest overall point score from the seven (7) rounds would be awarded with cash as well as tackle donated by Maver (UK). Venue regular, Andy Kinder started the campaign paired with local man, Graeme Wall. However, due to work commitments, Graeme unfortunately found himself needing to find a regular substitute so the honours were shared with none other than Tommy Pickering – not a bad stand in! Below, Andy reflects on what has been a successful series – one which saw him and partner’s Graeme Wall and Tommy confirm overall victory with one round still to go. “Round 9 of the Maver Winter pairs and, with partner Graeme Wall working again, it meant I had to call upon my able stand in – the super sub Tommy Pickering“. “Tommy drew peg 30 on Adams – a peg he has fished a few times before – whilst I found myself on Island 21. It was a funny sort of day for me. I managed to catch all my fish really tight along the island in different spots to end up with 30lb 2oz, which was good enough for second in the section. Partner Tommy smashed up Adams lake and won the match overall with 85lb so, three (3) points in the pairs and second overall on the day“. “With one round still to go we had pretty much won the series overall unless we had an absolute disaster come the tenth and final round“. “This year’s Maver Winter Pairs really was a great league all throughout. Plenty of banter but a really competitive league all the way through. The fishing has been hard but fair at times with the weather not being at it best most rounds“. “A big thanks goes to all the Maver Dynamite Hayfield lakes team for making it so good and looking after all of us“. “Last but not least, thank you also to Tommy Pickering who stood in when Graeme was working. Top man“. Well done Andy, Graeme and Tommy. A real team effort!